One of the well known Yogi Berra quotes. 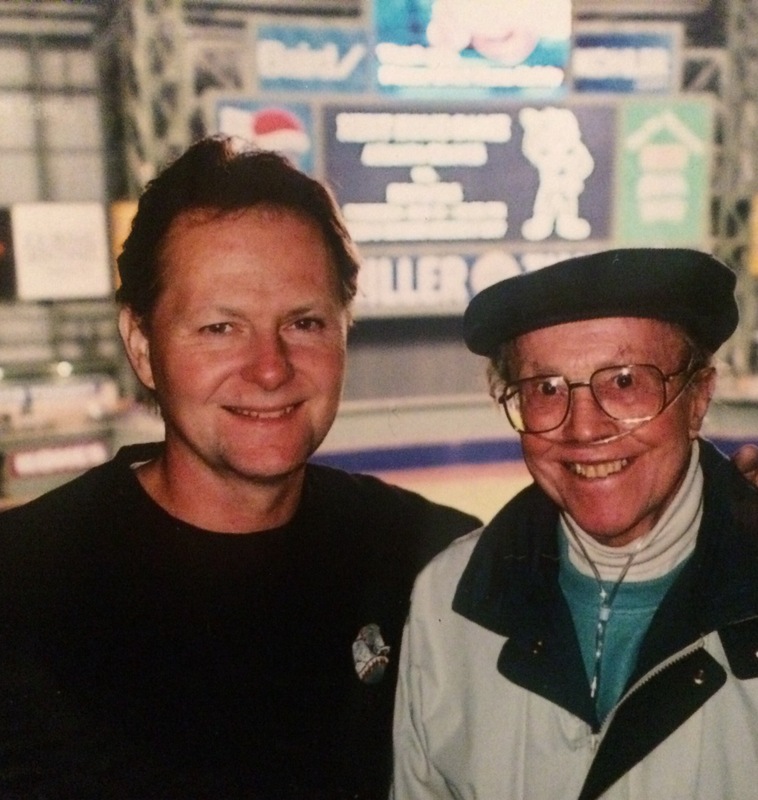 When news of this baseball legends passing came yesterday, I was compiling thoughts of my father-in-law. Today would have been his 94th birthday. Claude loved baseball so much, we asked the organist at St Adelberts to play “Take Me Out To The Ballgame” at the conclusion of his funeral. I still smile and get misty-eyed by the memory of everyone singing together as he made his final exit. Claude never missed opening day. He attended every season opener for the Milwaukee Braves and the Brewers. 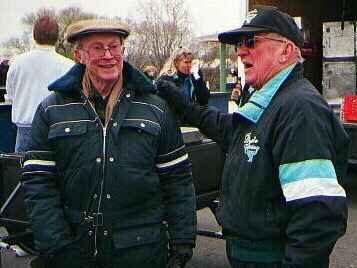 A local news crew interviewed he and his brother, Ron at one of their last appearances. The brothers, other family members, and friends would enjoy warm pasties, a tradition of their Upper Michigan roots. They would wrap each in foil and newspaper to keep them warm. Claude usually wore the snowmobile suit (in the above photo) to stay warm on cold openers at County Stadium. Miller Park, with the retractable roof, was built just before Claude passed away. The photo of my husband and his father was taken the first time we made it to the new home of the Brewers. The photo was taken in May, he passed on the next April. I’m pretty sure he made it to one more game that summer with David’s siblings. Precious memories, indeed. If you stopped by their home on Elm Avenue when the Brewers were playing, you would likely find Claude on the sun porch, watching the game on TV but listening to Uecker on the radio. He would certainly offer a tap beer from his basement bar and pretzels he kept in a large, glass pickle jar. They stayed fresher in glass. He might also share Cheez-Its, another favorite snack he always seemed to have nearby. He was such a hospitable guy, always with an ear-to-ear smile… Except when he was hungry. Hirschs are cranky when they haven’t been fed. David gets both qualities from his folks. He is always happy to entertain at home or join a party. Claude was much the same. Oh, how extroverts energize being around people! He was in the Air Force and in California with a few buddies. They were hitch hiking (it was safe and acceptable back then) and had been picked up by a gentleman. The man made conversation with the servicemen, asking each where they were from. Claude said he was from West Allis, Wisconsin. The man said he had a sister from there but she had passed away. Such a small world– they were riding in a car driven by Claude’s uncle! His mother, Regina, died at a young age when Claude was just 14. They had lost touch with relatives. I hope I told the story correctly. I’ll update it later if I missed any details. David’s parents met at Marquette University. They loved to dance! Claude was a dance instructor and they frequently had dance parties in their tiled rec room in the basement. The room had a Polynesian theme with bamboo decor. Perhaps this is why we have a Tiki Bar in our backyard? I know one of the first projects David took on at our home was finishing the basement with a theater and full bar, just like his pop! We didn’t have Andeker on tap though. I could keep reminiscing about my father-in-law. I’m grateful we had precious memories in our short time together. Perhaps this glimpse into our extended family will connect the dots as I continue writing. For now, it was just fun to walk down memory lane.